Field Marshal Erwin Rommel shortly after arriving in North Africa, 1941. The Desert Fox, the most well respected Nazi commander. German General Erwin Rommel arrives in Tripoli, Libya, with the newly formed Afrika Korps, to reinforce the beleaguered Italians’ position. In January 1941, Adolf Hitler established the Afrika Korps for the explicit purpose of helping his Italian Axis partner maintain territorial gains in North Africa. “For strategic, political, and psychological reasons, Germany must assist Italy in Africa”, the Fuhrer declared. The British had been delivering devastating blows to the Italians; in three months they pushed the Italians out of Egypt while wounding or killing 20,000 Italian soldiers and taking another 130,000 prisoner. But why are they wearing such heavy clothing? It does get cold in the desert. In the winter months it can get below freezing and normal day temperatures are usually around 10 degrees Celsius (50 degrees Fahrenheit), sometimes colder. Most likely, this picture was taken in the winter. 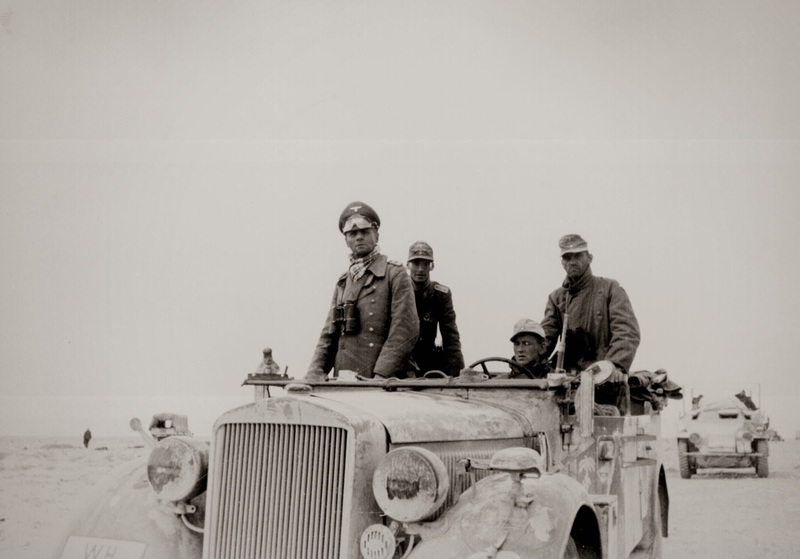 This vehicle is the Horch 1937 type 901, it was one of a few vehicles that Rommel was known to have used in North Africa. He also used three SDK.FZ 250/5 one called “greif” that translates to Griffon, the second was called “Igel” which translates to Hedgehog, and the last SDK.FZ was called “Adler” which translates to Eagle. One other vehicle Rommel was known to have used was a captured British AEC 4×4 ACV (more often called the Dorchester).